Gotta get this out of the way. 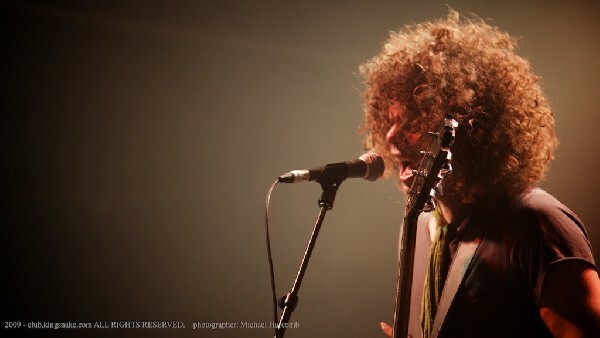 Andrew Stockdale (the singer) from Wolfmother looks like Carrot Top. There I said it. And while I'm at it Dhani Harrison from thenewno2 looks a lot like his dad George....Harrison....from the Beatles. I'd like to 1st review the show lighting from a photographer's point of view. It was bad - too much red and green. But that's my only gripe. Thenewno2 are a great sounding band with some great lineage. You can hear the similarities between Dhani and his father but it's not in a bad way like Julian Lennon - sorry Julian but "Valotte" sucked. Thenewno2 was the band I was most looking forward to tonight and their 6 song set left me wanting more. Gotta get this Cd. The Heartless Bastards came out screaming and didn't stop. There set was a mix of fantastic vocals and guitar from Erika Wennerstrom and a solid pulse from the rest of the band. The crowd really came alive when they hit the stage after being more subdued for thenewno2. Wolfmother are back with their 2nd album "Cosmic Egg" and a new band. Founding members Chris Ross (Bassist and keyboards) and drummer Myles Heskett left the band due to "irreconcilable personal and musical differences" leaving Stockdale to bring in 3 new members and a new energy. The addition of a 2nd guitar really helped during "Woman" when Stockdale knocked his mic stand over, tried to recover it and dropped his guitar. Minutes later everything was OK but the band never dropped a beat. The crowd loved them but I really couldn't get into it. I like the music but the show was almost "paint by numbers". Jump here, riff here, pounding drums. Just stuff we've seen and hear before but nothing groundbreaking. Cool band but not sensational.